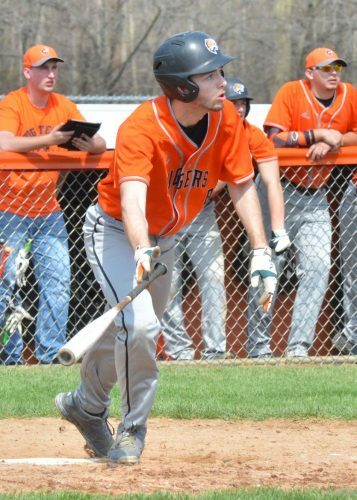 WARSAW — Saturday’s double header with South Bend Riley was reflective of Warsaw’s team colors, orange and black. The first game was bright, vibrant and full of excitement, just like the Tigers orange jerseys. Warsaw escaped the Wildcats 8-7 to pick up their second win of the season. Game two, however, was better described by the color black, at least from Warsaw’s perspective, as Riley won 16-4. The Wildcats drew first blood in the opener, scoring two runs in the top of the third. 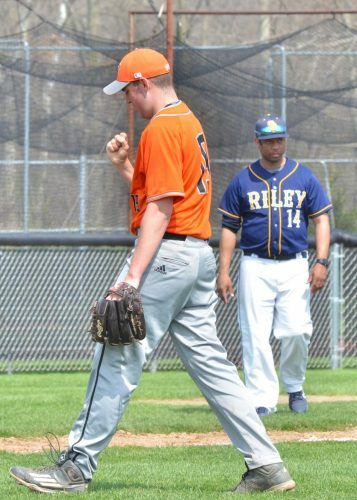 That opened the flood gates for both teams as they would score seven combined runs in the third and fourth innings, leading to a 4-3 Riley advantage. The Tigers kept the ‘Cats off the board in the fifth and tied things up on an RBI from Jared Hawley that scored Collin Marshall. Riley was not deterred, however, and would score three runs in the top of the sixth. All three on the runs came with two outs on the board for the visitors. Adam Broadstreet crushed a two-RBI double to put the Wildcats up 6-4. Broadstreet was then brought home on an RBI single from Nic Jerue to make it 7-4. The senior class got things going for the Tigers in the bottom half of the frame as Alex Miller got a leadoff single. miller was then brought home by fellow senior Jordan Steffensmeier, cutting Riley’s lead to 7-5. Steffensmeier crossed home after an RBI single from a pinch-hitting Matt Francis. Riley found itself leading 7-6 with the bases loaded and elected to bring in reliever Nick Riley. That decision worked out just fine for Warsaw’s Bryce Sensibaugh as he turned Riley’s first offering into a two-run single. Pinch runner Kyle Kuhn and Marshall scored on the play to give Warsaw an 8-7 lead. Jordan Jones came on to close out the game for Warsaw. 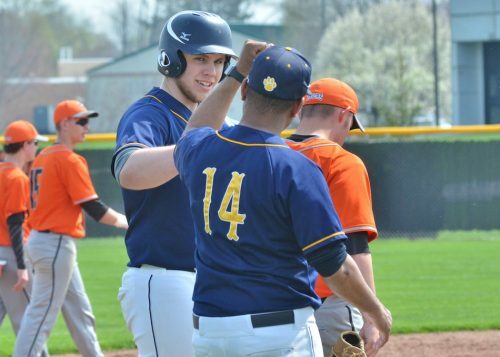 The senior allowed three straight Wildcats to get on base with one out but then fanned Zach Meert and secured the save after forcing Jayce Tate to pop out. Matt Shapiro picked up the win for Warsaw. Hawley and Steffensmeier were each 2-4 with two RBIs while Sensibaugh was 2-3 and led the team with three RBIs. Game two was far less exciting as Riley picked up the 16-4 win. Michael Nunez took the loss for the Tigers. Hawley was 2-3 while Marshall was 2-3 with a double. Warsaw (2-3) travels to take on Wawasee Monday evening in both team’s Northern Lakes Conference opener while Riley (2-5) will once again be on the road as it opens conference play at Washington. Adam Broadstreet gets some respect from Riley coach Greg Harris after knocking in two runs. 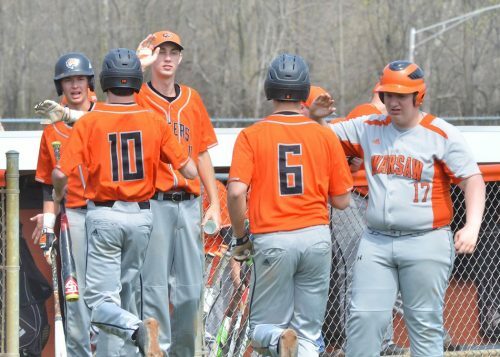 Kyle Kuhn (10) and Collin Marshall (6) are welcomed back to the dugout by Luke Baker, Jordan Steffensmeier and manager Tyler Hubler after scoring the tying and go-ahead runs in Saturday’s opener. Jordan Jones gives a fist pump after recording a save in game one against Riley.